Professor Bonner is the program lead and has research expertise in chronic conditions, chronic kidney disease and grounded theory, with a focus on renal nursing and healthcare, and advanced clinical practice roles. Our research involves interdisciplinary teams working collaboratively across nursing, pharmacy, medicine, public health, exercise physiology, cells and tissues, epidemiology and dieticians, as well as with consumer representatives. It aims to support the one in five Australians that the Australian Institute of Health and Welfare reports are affected by multiple chronic diseases, making research in the area essential for supporting a growing need in the population. Researchers focus on mentorship and team building, and are driven to secure funding, produce original research outcomes and publish high-quality papers. We have a record of successful team building across staff and student groups in research and postgraduate areas. Peripherally InSerted Central catheter Securement: the PISCES Trial. Development and implementation of best flushing practice to optimise peripheral intravascular catheter patency. The FLiP Study: Flushing in Peripheral Intravenous Catheters. Optimising PIVC patency through implementation of best flushing practice. Research includes health service innovation and advanced nursing roles. Our research into the role of nurse practitioners resulted in development of practice, education and authorisation standards for nurse practitioners in Australia. Research goals include the development of evidence-based approaches to nursing care and management of the mechanically ventilated critically ill patient in intensive care. The Wound Management Innovation Cooperative Research Centre is an Australian collaborative research initiative to transform outcomes. Led by QUT, it has 22 partners including health care providers, government, industry and university research institutes. Research priorities include industry guided development of promising wound technologies and supporting related projects. QUT was involved in the establishment of the first Centre of Research Excellence (CRE) in chronic kidney disease (CKD), funded by the National Health and Medical Research Council (NHMRC). The CRE is moving research towards improving detection of CKD, slowing progression and reducing cardiovascular deaths. An aspect of this research is facilitating better care pathways, with the aim of decelerating rising rates of renal replacement therapy (RRT) and a rationalisation of resources. 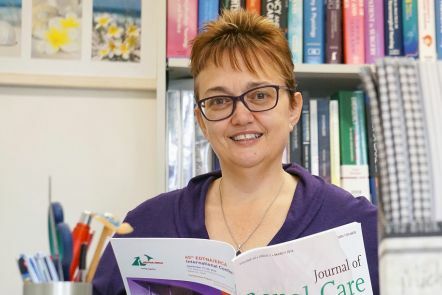 Professor Helen Edwards has led two studies which have demonstrated that a community Leg Club for people with chronic leg ulcers can improve healing rates compared to standard individual in home visits. Improvements have also been demonstrated in pain, oedema, functional ability, quality of life and morale. In addition, the new model of care has shown to be cost effective for the community organisation.